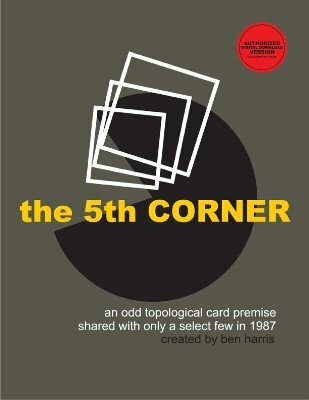 So what is the 5th Corner? It's a splash of ideas and techniques with a single playing card and it's ripped corners. You are both "one ahead" and "two behind" at the SAME TIME. This charming but annoying attribute is what probably led to the stony silence heard by the author in 1987. Can YOU make head-way with this strange and bizarre single-card oddity? Why not give it a go, STRETCH your mind and explore. 1st edition 1987; 19 pages.